If there's a comfort food that everyone can appreciate, it's macaroni and cheese. There are countless recipes out there but I still find myself looking for the *perfect* one. 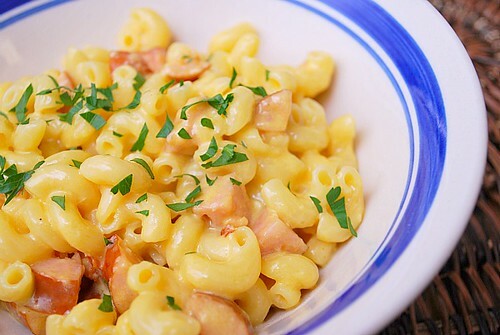 I love my mac and cheese on the creamy and very cheesy side. When I stumbled upon this mac & cheese recipe made on the stove top that had numerous rave reviews, I couldn't pass it up. As a result, I got exactly what I was hoping for and created this Cheesy, Meaty Mac & Cheese using my Instant Pot. I don't think I'll be searching for another mac and cheese recipe anytime soon because this was... perfect! I've made my share of mac and cheese recipes, all of them very good. But this recipe is by far my favorite... at least for now. This is Alton Brown's recipe which is made on the stovetop and converted it for the Instant Pot. 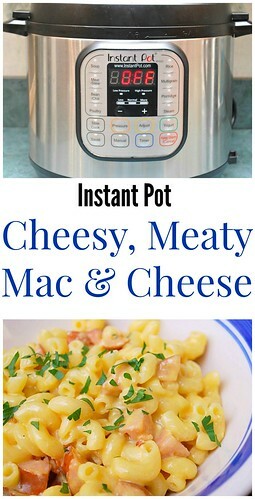 It couldn't have been any easier and the dish is everything I'm looking for in a mac and cheese. I made some adaptations, one of which was adding diced cheddar bratwurst for a heartier dish. You can certainly omit the cheddar bratwurst and use the recipe as a great base to add other ingredients to customize your mac and cheese. Some ideas - crumbled bacon, smoked sausage, steamed broccoli, mixed vegetables, etc... the ideas are endless! Press MANUAL on the IP. Add the pasta, water, and butter into the IP. Whisk together the eggs, half & half, hot sauce, salt, pepper, and mustard. Stir into the pasta and add the cheese and diced cheddar bratwurst. Stir until cheese has thoroughly melted and pasta warmed through. Serve and garnish with parsley if desired.